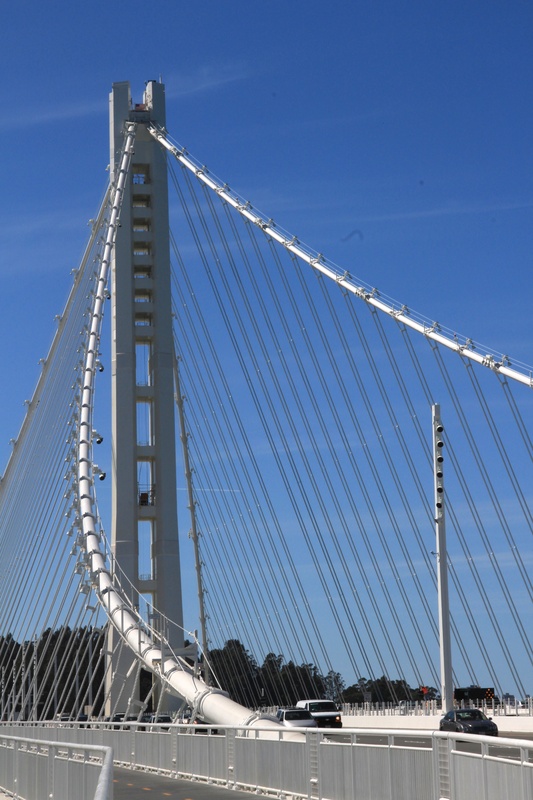 We drive the newly opened eastern span of the San Francisco Oakland Bay Bridge. The roadbed shoots us up the incline and our eyes follow the skyward swoop of the single 525-foot tall tower. Its simmering white color, minimalist side rails and the 10-lane wide expanse (widest bridge in the world according to the Guinness Book of Records) gives a feeling that the car is soaring. Driving the bridge at night is even more impressive. The elegant 80-year old San Francisco side wears lights like strings of pearls while the 7-month old Oakland side is crisply modern, illuminated by a dazzle of brilliant LEDs . On a clear and warm afternoon we opt for a more intimate exchange by strolling a walkway suspended over the bay between the original and the new eastern span. The original Oakland side was the ugly sister, part railroad bridge cantilevers and flat causeway. It sits hauntingly quiet now, cranes and trucks cluster where small crews manage the deconstruction of the span in the reverse plan of how it was originally built. From where we stand on the walkway we can watch the rapid dismantling of this old span from just a few feet away. A bridge over the San Francisco Bay was conceived as early as the gold rush days. In the 1870’s a Bay Bridge Committee worked on plans for a railroad bridge. Self proclaimed Emperor Norton issued public decrees ordering the building of a suspension bridge connecting San Francisco with Oakland via Goat Island (now Yerba Buena Island). But the water was too deep and the distances too long for the engineering of the day. In July 1933 construction began on the two distinctly different spans. Since its opening to vehicle traffic in November of 1936, six months prior to the Golden Gate Bridge, the Bay Bridge has remained one of the longest and busiest bridges in the country. 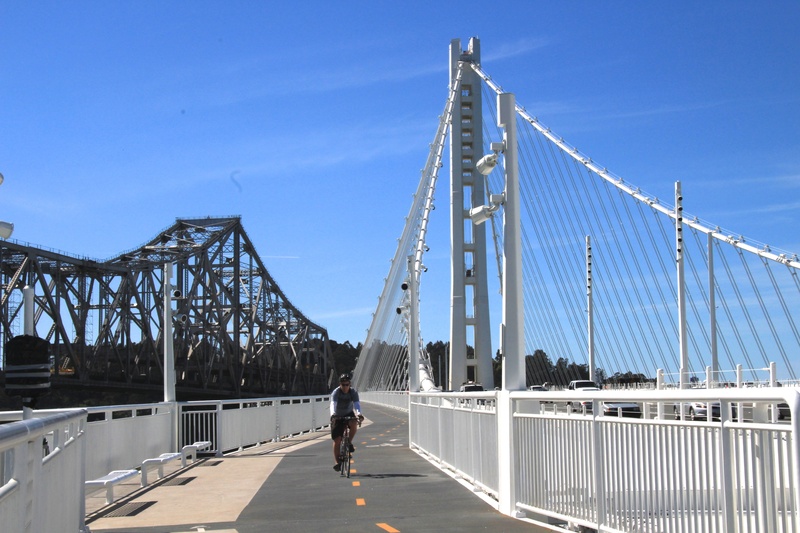 As soon as contractors dismantle a portion of the original bridge that sits in the way, bikes and pedestrians will be able to travel the 2.2 mile long pathway from Oakland to Yerba Buena Island. Only the final quarter mile of the path has yet to be finished. In the meantime, it is exhilarating to walk so close to the deconstruction on one side and the roar of traffic on the other while surrounded by terrific views of The City and The Bay.